Electric Vehicles: How Far Have We Come in 100 Years? If you want to get a sense of how far the electric car market has really come, it's instructive to read "Foreign Trade in Electric Vehicles," an article available on the New York Times Website. In glowing terms, the article describes the future of electric cars. The vehicle "has long been recognized as the ideal solution" and is "cleaner and quieter" than other cars, as well as "more economical." The article also praises the electric vehicle (EV) battery. "It is simple, light, easy to take care of and far more efficient than the old lead battery," and the new battery "solves the problem of electric transportation." 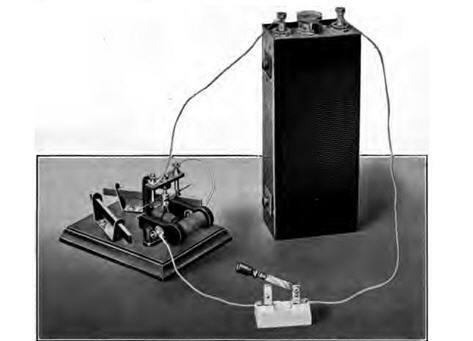 An Edison storage battery in test setup, from the 1916 monograph "The Edison Alkaline Storage Battery," by the technical staff of the Edison Storage Battery Co. The article is dated Nov. 12, 1911 -- 100 years ago this month. It's hard to look at the article and not wonder how far we've come. Yes, the EV is back. Nissan has its Leaf. Ford has two EVs coming out soon. General Motors has announced the Spark EV and has the Chevy Volt, an electric car that burns gasoline part of the time. Tesla plans to roll out the Model S soon and is working with Toyota on an electric RAV4. Mitsubishi has its i MiEV. Even DeLorean has announced an electric car. But the EV battery... has it really advanced much in the past 100 years? In a 1998 Design News article, battery makers discussed the creation of a lithium-ion battery with an energy density of 90Wh/kg. Thirteen years later, the Nissan Leaf battery is rated at 140Wh/kg -- a 55% increase. That's not bad, but is it enough to make the EV battery a serious competitor with gasoline, which offers 80 times as much energy and a five-minute refueling capability? Moreover, there's the issue of cost. In the 1998 Design News article, engineers set a target of $100/kWh to make EV batteries more competitive. Today, the cost figure still hovers between $800 and $1,000/kWh. Chrysler Epic minivan: 68 miles. Ford Ranger EV: 58 miles. GM S-10 electric pickup: 45 miles. Toyota RAV4 EV: 118 miles. Many EV proponents have explanations for all this. A popular one is the "big oil conspiracy." According to this logic, oil executives have conspired with automakers to suppress development of EVs over the years. Numerous Websites are dedicated to explaining this conspiracy. However, they have not explained why our universities have had limited luck in creating a revolutionary battery over the past 100 years. The truth is that the EV's real gains have been in speed and performance. On drag strips around the country, EV converters are turning quarter-mile times as low as 10 seconds using old Ford Pintos and Datsuns. The old GM EV1 was said to have hit a speed of more than 180mph, and the White Lightning racing EV reached 245mph. If Thomas Edison (who invented the battery discussed in the 1911 New York Times article) could see the performance of today's EVs, he'd be astounded. Still, Edison might be equally surprised by the lack of advancement in the area of battery energy. Many potential buyers are still turned off, not only by the cost, but by the pure EV's inability to make long trips. Bill Reinert, national manager of advanced technology vehicles for Toyota, said it best this year, when he told us: "Even if I'm covered 90% of the time, I'm probably unlikely to make a [buying] decision that leaves me uncovered 10% of the time." Obviously, researchers are working on the energy issue, but their efforts would be best flavored with a little public patience. If the 100-year-old New York Times article teaches us anything, it's that vehicle electrification could still be a long, arduous journey. For a look at GM's Chevy Volt, go to the Drive for Innovation site and follow the cross-country journey of EE Life editorial director Brian Fuller. In a trip sponsored by Avnet Express, Fuller is taking the fire-engine-red Volt to innovation hubs across America, interviewing engineers, entrepreneurs, innovators, and students as he blogs his way across the country. My Chevy Volt Test Drive. Video: Would You Buy a Chevy Volt? Video: Our Prius Plug-In Test Drive.